List of symbols used in thermal system. q = Heat flow rate, Kcal/sec. θ1 = Absolute temperature of emitter, °K. θ2 = Absolute temperature of receiver, °K. ∆θ = Temperature difference, °C. K = Conduction or Convection coefficient; Kcal/sec-°C. Kr = Radiation coefficient, Kcal/sec-°C. 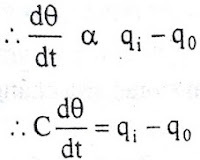 H = K/A=Convection coefficient, Kcal/m2-sec-°C. H = Thermal conductivity , K cal/m-sec-°C. Thermal systems are those that involve the transfer of heat from one substance to another.There are three difference ways of heat flow from one substance to another.They are conduction, convection and radiation. Note : θ4 is called effective temperature difference of the emitter and receiver. The model of thermal systems are obtained by using thermal resistance and capacitance which are the basic elements of the thermal system.The thermal resistance and capacitance are distributed in nature.But for simplicity in analysis lumped parameter models are used. In lumped parameter model it is assumed that the substances that are characterized by resistance to heat flow have negligible heat capacitance and the substances that are characterized by heat capacitance have negligible resistance to heat flow.The thermal resistance, R for heat transfer between two substances is defined as the ratio of change in temperature and change in heat flow rate. The thermal resistance, R for heat transfer between two substances is defined as the ratio of change in temperature and change in heat flow rate. Thermal Capacitance, C is defined as the ratio of change in heat stored and change in temperature. 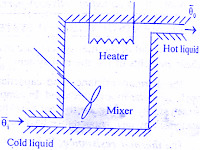 Consider a simple thermal system shown in the below figure.Let us assume that the tank is insulated to eliminate heat loss to the surrounding air, there is no heat storage in the insulation and liquid in the tank is kept at uniform temperature by perfect mixing with the help of a stirrer.Thus, a single temperature is used to describe the temperature of the liquid in the tank and of the out flowing liquid.The transfer function of thermal system can be derived as shown below. Let us assume that the temperature of inflowing liquid is kept constant. Let the heat input rate to the thermal system supplied by the heater is suddenly changed from Q to Q + q1.Due to this, the heat output flow rate will gradually change from Q to Q + q0.The temperature of the outflowing liquid will also be changed from θ0 to θ0 + θ. In this thermal system,rate of change of temperature is directly proportional to change in heat input rate. The constant of proportionality is capacitance C of the system. Equation (5) is the differential equation governing system.Since equation (5) is of first order equation, the system is first order system. θ(s)/Q1(s) is the required transfer function of thermal system. 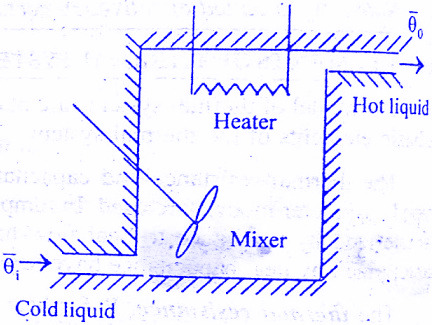 In this post we have learnt transfer function and mathematical Model of thermal system.You can download this article as pdf,ppt.If you have queries you can mail us @ palakalaamarnath@gmail.com.Comment below if you have any queries!